Author Spotlight: Jerome Brooke, Author of "Wise Women" & "The City of the Mirage"
Jerome Brooke lives in the Kingdom of Siam. He is the consort of Jira, Princess of the lost Kingdom of Nan. He has written The City of the Mirage (Books to Go Now) and many other books. 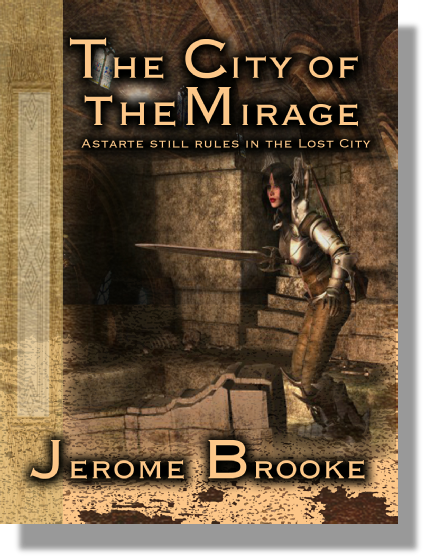 The City of the Mirage (Amazon) is a Dark Fantasy, one of the Divine Astarte Histories. Astarte the Great Queen rules a vast empire of the stars. She calls the Warrior to fight at her side. Jira was born in Nan, in the rugged Highlands far to the north of Bangkok. Nan is an ancient Kingdom, and still has its royal family. Many of its people have a few drops of the old royal blood. The kings and magnates had many wives and concubines – over the centuries. Even now, Nan is remote and hard to reach. The people until recently took their laundry to the banks of the River Nan. Only recently was it incorporated as a province of Thailand. Jerome and his two ladies were recently on vacation in Nan. The sober Siamese were willing to kindly tolerate the whimsies of a poet and dreamer – one who is clearly a little mad. A dear friend, Kathy, escorted us to the fine museum and art gallery of the town. Jirachaya, beloved by her future subjects, reigns supreme in the remote region. She has been crowned as Miss Superstar 2011. The beauty of Eurasian girls is much admired in the Kingdom. October is the time of the Dragon Boat races in Nan. The long boats may be seen on the River Nan. Nan has a dark history of war. The King of Pagan (Burma) carried off the people of Nan into slavery long ago. Remote – the lost kingdom remains as it ever was lost in the hills and unknown to the world. In the remote regions the Hill Tribes eke out a living. The children have little chance of an education or escape. The Siamese view them with disdain – as they do much of the rest of the world! This is an absolutely fascinating posts and I love fantasy so I will definitely check Jerome Brooke’s books out. Thanks for sharing, I definitely learned a few new and interesting tidbits tonight. Previous PostPrevious Interview & Giveaway w/ Samantha Holt, Author of "The Angel's Assassin"